If I had to sum up these cookies in one one word, it would be PLEASURE. More specifically, decadent yet wonderfully guilt-free pleasure. Yes, they offer all the pleasure of a brownie in a perfectly bite-size shape! I came up with this double chocolate almond butter cookie whammy because I’ve been lusting after my Keto brownies AND after cookies in equal measures. So I thought, why not halve my efforts and combine the two? 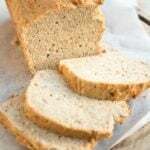 When you’re eating low carb, you’re cutting out all grains. Therefore, most low carb cookies contain either almond flour or coconut flour – or a mix of both. 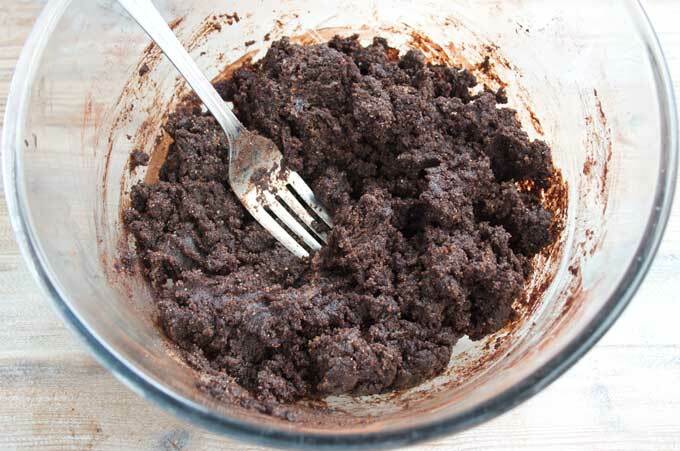 But there is another, ingenious way to make low carb cookies. With nut butter! Nut butter is basically your grain free flour and healthy fat rolled into one. 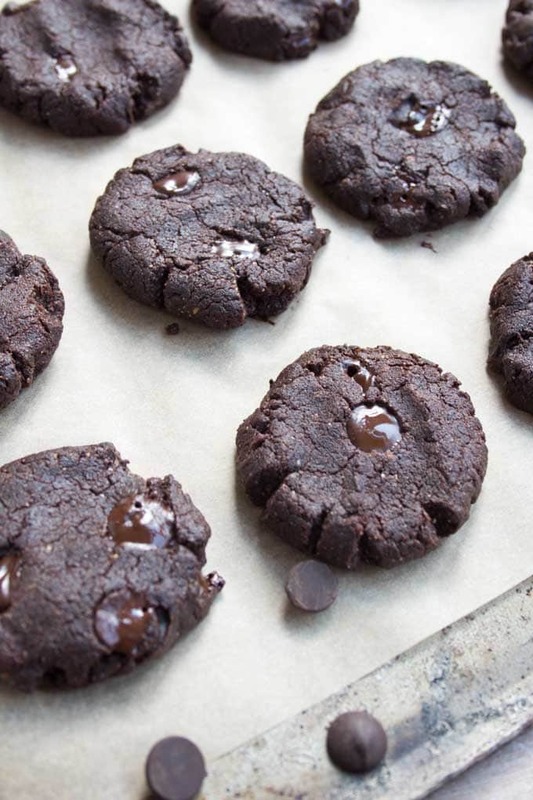 The main ingredient of these almond butter brownie cookies is, you guessed it, almond butter. 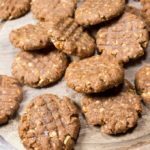 They’re an adaptation of my low carb peanut butter cookie recipe, which makes crunchy sugar free peanut butter cookies that are so good you’ll want to hide them so you won’t have to share. I love how incredibly easy this recipe is. 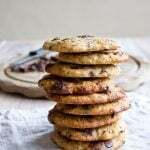 And how it’s possible to make the most deliciously moist and crispy cookies without flour altogether. 1.) 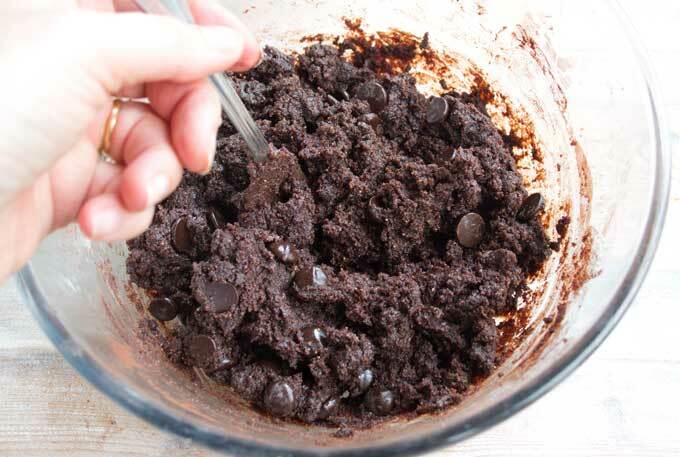 Add all ingredients except the sugar free chocolate chips in a bowl. The almond butter should be room temperature so it’s soft and easy to handle. 2.) 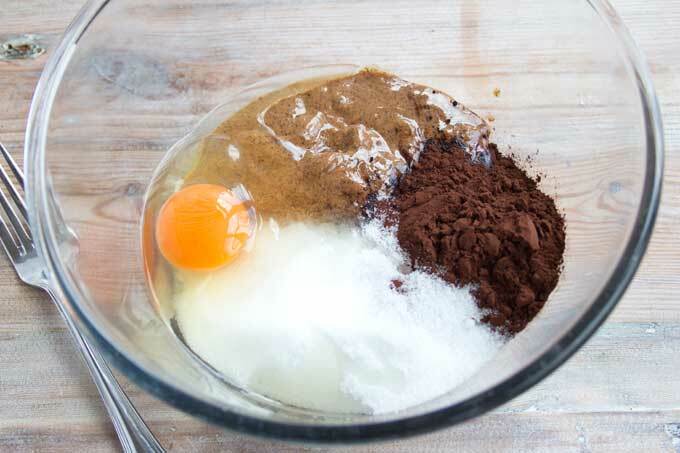 Mix with a fork until well-combined. 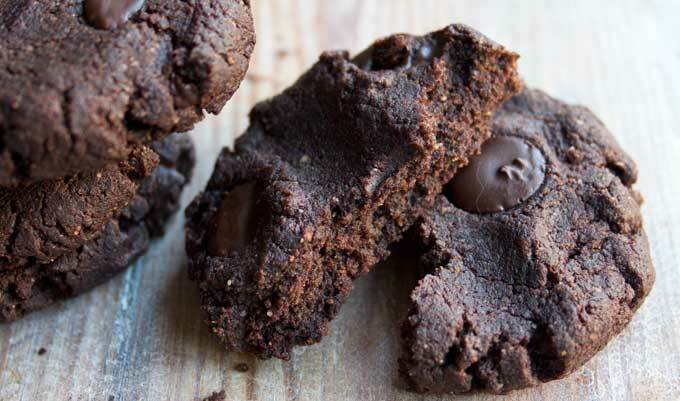 If your cookie dough is a little firm and crumbly, add up to 3 tbsp of almond milk to thin down the dough so it looks gooey and fudgy like in the picture below. Whether you need the almond milk will depend on how runny or compact your almond butter is. Don’t add more than 3 tbsp or the cookies will become too fragile. 3.) Fold in the sugar free chocolate chips. 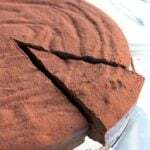 If you cannot get hold of sugar free chocolate chips, you can use chopped sugar free chocolate or dark chocolate instead (choose a variety with 85% cocoa solids minimum). 4.) Form balls with your hands and place on a baking pan lined with parchment paper. Press into disks about 1 cm thick and with a diameter of circa 6 cm. The recipe works without chocolate chips, but adding them does take it all to a new level of yum. Lily’s chocolate chips are a good option if you are based in the US. If you are in the UK, Cavalier makes stevia sweetened chocolate which you can chop and use in place of the chocolate chips. Unfortunately, shop-bought sugar free chocolate is not cheap. 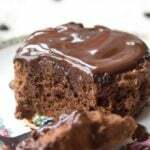 You could make your own by melting unsweetened chocolate (100% cocoa solids) and sweetening it with stevia glycerite. I’ll be putting up my recipe and recipe tips for homemade sugar free chocolate soon. Alternatively, you can opt for quality dark chocolate with a minimum of 85% cocoa solids. I recommend trying a variety with 90% cocoa solids – for example Lindt. It tastes good and contains only 14 g carbs and 7 g of sugars per entire bar. One square contains 1.4 g of carbs. 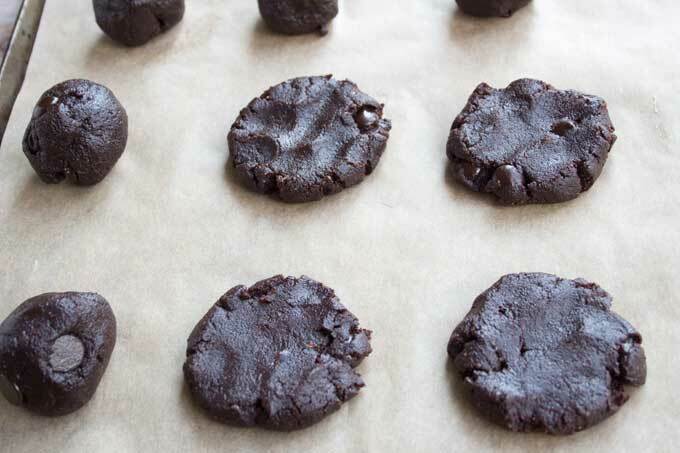 Calculated across this entire almond butter cookie recipe, using 90% chocolate would increase the carbohydrate content of 1 cookie by only 0.5 grams. Do you like your cookies extra crunchy? If you bake almond butter cookies for 10-12 minutes as stated in the recipe, they will be soft and gooey on the inside just like a brownie with the tiniest crunch on the edges. If you want more crunch, simply flatten them more and make them slightly smaller so you end up with around 20 cookies. 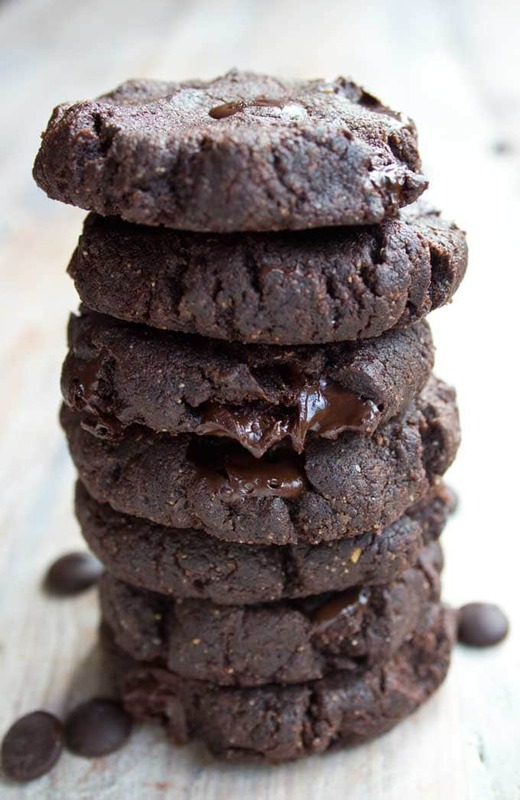 Then bake an additional 2-3 minutes (and maybe call them double chocolate cookies instead ;)). I am running to the store right now to grab a few ingredients. I can not find monk fruit sweetener anywhere . Amazon or online at thrive market, but nowhere around me at a store. So sad. I will have to substitute. I made snickerdoodles last weekend with Stevia In The Raw, and they were not sweet enough and were really dry. I am not making these with stevia, but I don’t know which sweetener option to choose that’s keto friendly. I think sucralose May be my only option but I won’t know until I get to the store, if they have erythritol I will buy that but I’m not sure if they have it. I hope my cookies turn out as good as everyone else’s. Thank you for the recipe. Any tips to using the sucralose if I have to? I have never used sucralose, so I don’t know. I find that I tolerate erythritol best. Do give it a try, it’s a great low carb sweetener. 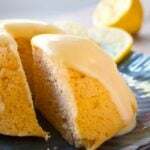 Finally a keto friendly dessert recipe that works as stated and tastes great. 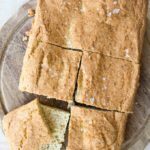 I am an experienced Baker, but have found many keto baked items don’t behave as described in recipes. This one lined up perfectly with the instructions. I used Swerve and 1 tablespoon of almond milk. I made 12 cookies and baked them for 11 minutes. They were soooo good. 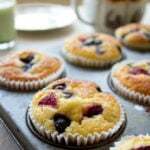 I will be looking for more of your recipes to satisfy my sweet tooth. I just found your site this morning and have already made these. 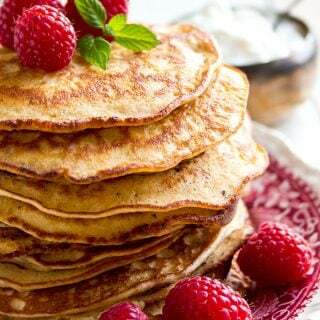 So easy and YUM! These are dangerously good and definitely the best keto friendly brownie like dessert I have tried so far. Can’t wait to explore and try your other recipes! Thank you!!! Oh my….these turned out awesome! I didn’t have any chocolate chips, but didn’t miss them! Definitely will make over and over and over…lol! Made these exactly as published and cooked for 10 min. Delicious! A new favorite for certain. Great dipped in espresso coffee as an afternoon pick up. I opted for erythritol and used Lilly’s sugar free chips. Recipe doesn’t mention when to stir in chips. I did it with the other ingredients. So simple! A keto keeper! cookies and coffee… 2 of my favourites!!!! Just made these over the weekend – wasn’t sure the recipe would work, but was pleasantly surprised! I love these cookies!! 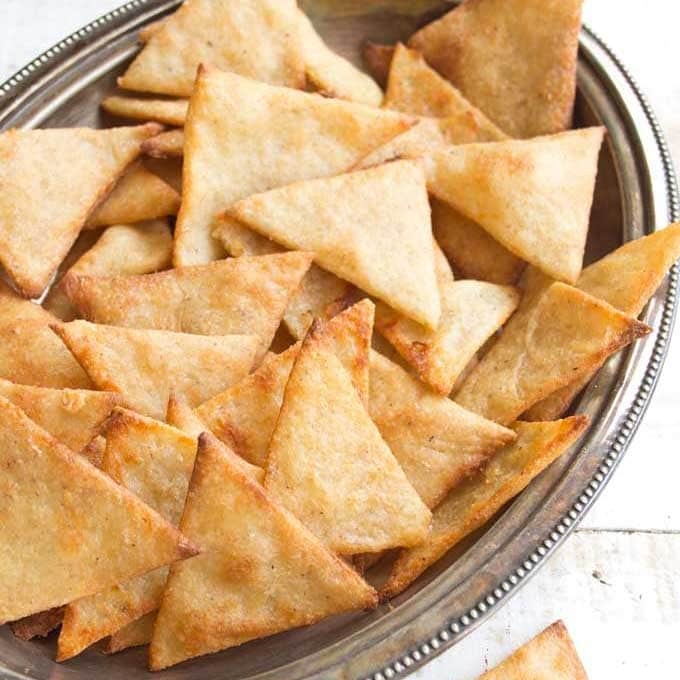 Made them last night along with your sugar cookie recipe, also delighful! Thank you so much for your blog! can this be baked in in a 9×9 pan? How long and what temp? Thank you! Hi Patricia, if the mix ends up the same height of the cookies I made (which I think it probably will), just stick to the same baking time. So each cookies would have 2.9 g of carbs ? It would be 0.8 net carbs, as that is the sugar amount. They were 2.8 total carbs, but they have a high fibre count. Normally we deduct fibre from total carbs to reach the net carbs. But as you can never have negative net carbs, it’s the carbs in the sugars that are then counted. These are FANTASTIC!! 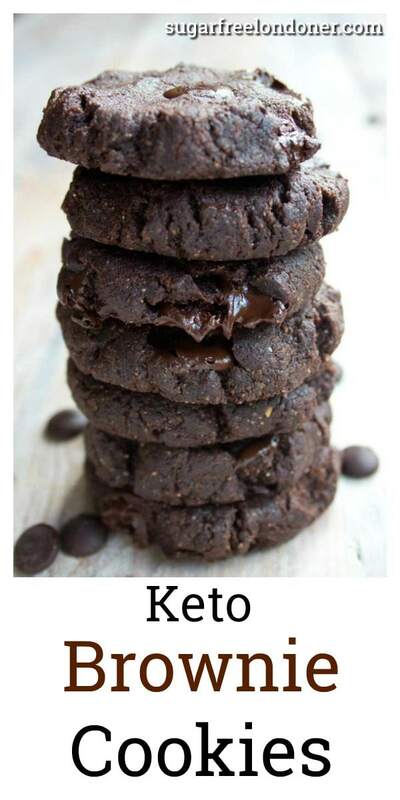 The best Keto cookies I’ve ever tried. 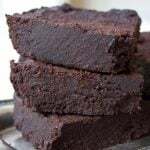 They taste just like brownies and they are so rich and satisfying! I’ve tried to make brownies and cookies and both have crumbled. What am I doing wrong? Well, having read the recipe WRONG I added Almond flour instead of Almond butter, and it wasn’t till I started to bring the ingredients together that I noticed. So it was panic stations till I added another 2 eggs, a little butter and a touch of milk, that I put it into my brownie tin and baked for 20 mins. I now have a tray bake and the most amazing choccy biscuits, but have no idea how many grams of carbs the traybakes got in it, but it is rather nice. Thanks for the recipe. I don’t have any granulated sugar or alternatives, do you think I could use honey or would that mess it up? Can we make these with peanut butter aswell? Can use you coconut sugar in this recipe as the granulated sweetener? Yes, absolutely. It would definitely work. 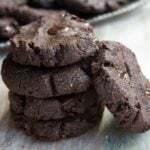 How many grams of protein is there per cookie? Hi Alec, i’ve just added it to the nutritional panel. It’s 5.5g of protein per cookie. Can powdered sweetener be used? Also can these be frozen? 10-12 mins it is! I love my cookies all soft and gooey. This looks like a recipe that I can make without messing up! Hi Bryan, I’m sure you won’t mess it up at all 😉 Let me know how it went once you’ve tried it! Just made these this morning but haven’t taste tested yet.. however the toddler in the house said they’re the best cookies ever! For the nutrition facts, did you accidentally switch the total carbs and fiber counts? Hey Kim, thanks for your question. I did not switch them around, but I’ve double-checked and noticed that the field for sugar was not filled out. Each cookie contains 0.8 grams of sugars. Therefore, that’s the net carb count as fibre can never negate the sugar. Thanks for your comment Marisa 🙂 I’m having almond butter envy!! Now I want to go make my own straight away…. THANK you for this recipe!!!! I’ve just taken the first batch out of the oven and they are AMAZING. Just like brownies! Hey Janine, I’m so glad you like the recipe. That’d great to hear!